Alouette IIIs, such as this one on board the Vikrant, have served in the utility and plane-quard roles for some years, but are now being introduced in the anti-submarine role, carrying Mk 44 torpedoes, for service from Leander-class frigates. Although the Sea Hawk equips only one squadron - INAS 300 - a total of 74 of these Hawker-designed, Armstrong-Whitworth-built fighters has been acquired by India over the years, including 28 from the German Navy. 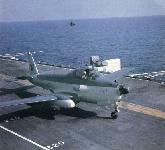 Scene aboard the INS Vikrant, showing an Alize on the between-decks lift and Sea Hawks on the flight deck. 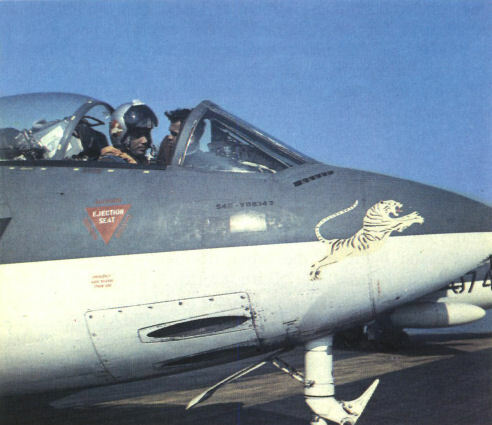 Close-up of the White Tiger emblem of INAS 300, the Sea Hawk-equipped fighter squadron. INS Vikrant, the Indian Navy's sole aircraft carrier, was laid down during World War II as the light fleet carrier HMS Hercules and was completed, with angled deck, in 1961. 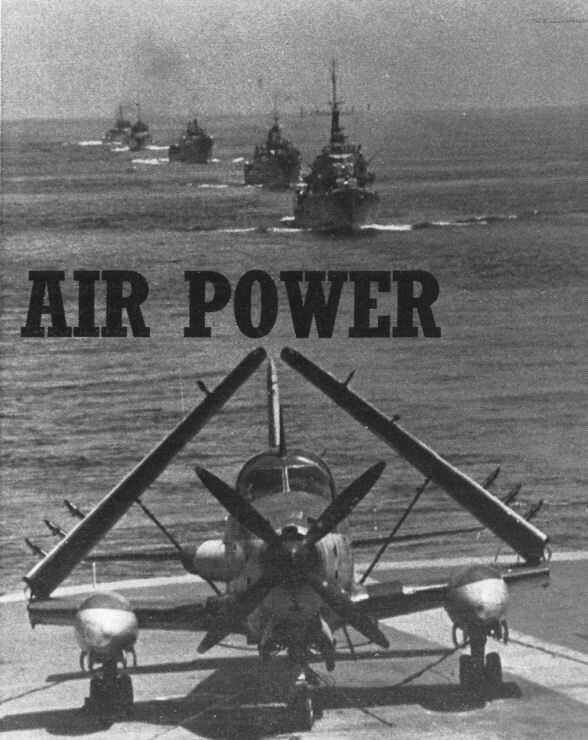 Her normal complement of aircraft comprises one squadron of Sea Hawk fighters and flight of anti-submarine Alizes and Sea Kings. 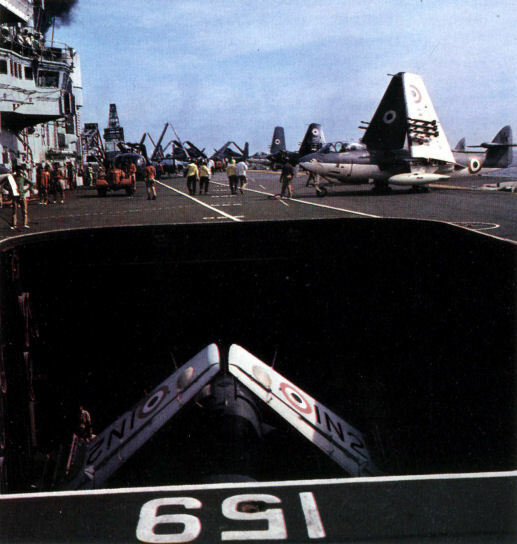 Scene aboard the INS Vikrant, showing an Alize of No 310 Squadron. A Breguet Alize in the markings of the White Cobras, No 310 Squadron. 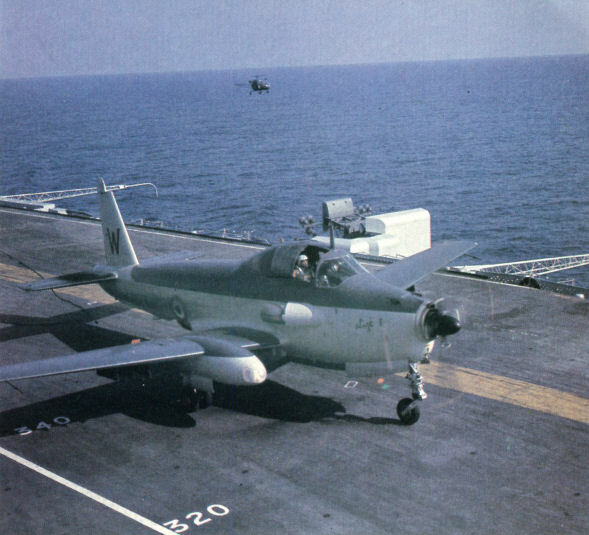 One of five Fairey Firefly TT Mk 4s obtained for the Indian Fleet Requirements Unit, supplementing five Firefly Is previously used for target towing. The Westland Sea King provides the Indian Navy with enhanced anti-submarine capability and the initial purchase of six is now in process of being doubled with the acquisition of two more batches of three at a time. A major addition to the Indian Navy's combat strength resulted from the decision to purchase Westland Sea Kings, taken towards the end of 1970. Six have been delivered to INAS 330 and three more are now on order. 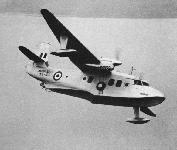 Initial equipment for the Indian Navy's air component comprised a batch of 10 Short Sealand amphibians, the first of which was delivered at the end of 1952 and the remainder during 1953. These two HAL HJT-16 Kiran jet trainers were added to the inventory of INAS 550 in 1969, this unit at INS Garuda having superseded the original Fleet Requirements Unit.